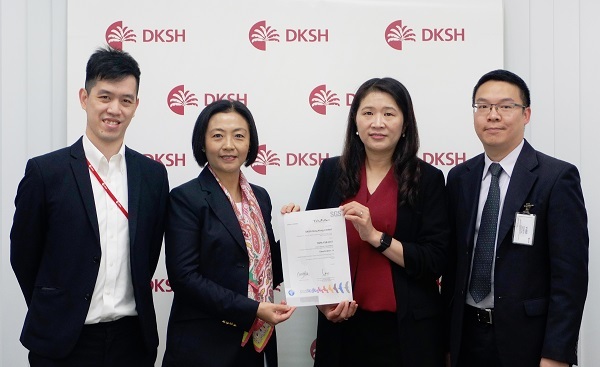 DKSH’s Mapletree Distribution Center in Hong Kong is the first certified distribution facility for pharmaceutical and medical products in mainland China and Hong Kong markets to successfully achieve the top accreditations in security. The internationally recognized TAPA FSR Level A Certification honors commitment to the best-in-class security standards. Hong Kong, March 14, 2019 - DKSH, the leading Market Expansion Services provider with a focus on Asia, has announced that its Mapletree Distribution Center in Hong Kong has been awarded the prestigious Transport Asset Protection Association (TAPA)’s Freight Security Requirements (FSR) level “A” certification in January 2019. The TAPA Certification is internationally recognized and is widely considered one of the most stringent and independent logistics and supply chain security certifications. As a non-profit organization, TAPA unites global manufacturers, logistics providers, law enforcement agencies and other stakeholders with the common aim of reducing cargo losses from supply chains through the development and application of global security. Consisting of three levels, FSR “A”’ being the highest, the TAPA certification process involves a wide range of auditing by independent TAPA-trained and accredited auditors. It focuses on how the goods are securely handled throughout the whole supply chain in the facility. Together with the GMP, GDP, ISO 9001 and ISO 13485 certifications, DKSH is proud to now also be certified under TAPA, proving its commitment in establishing, implementing and maintaining a comprehensive security management system to protect people, products and clients’ properties. “On behalf of the TAPA organization, we congratulate DKSH for attaining this esteemed certificate,” Lugg said. Transported Asset Protection Association (TAPA) is a trade association of risk & security professionals and related business partners from high technology and high-value companies who have organized for the purpose of addressing the emerging security threats that are common to the high-value industry supply chain. TAPA works to align its standards with Government regulations and to strive for mutual recognition. This enables its members to leverage on existing investment into TAPA standards and to prevent over-regulation. A fundamental TAPA objective is to affect positive change in the supply chain risk management and security practices of freight transportation and insurance communities as a whole. Major freight service providers are moving toward TAPA-recognized security standards for the care and handling of freight and are recognizing the inherent value of doing so. TAPA publishes several standards to secure the supply chain against theft, robbery, hijacking, contamination, substitution theft, pilferage and tampering.